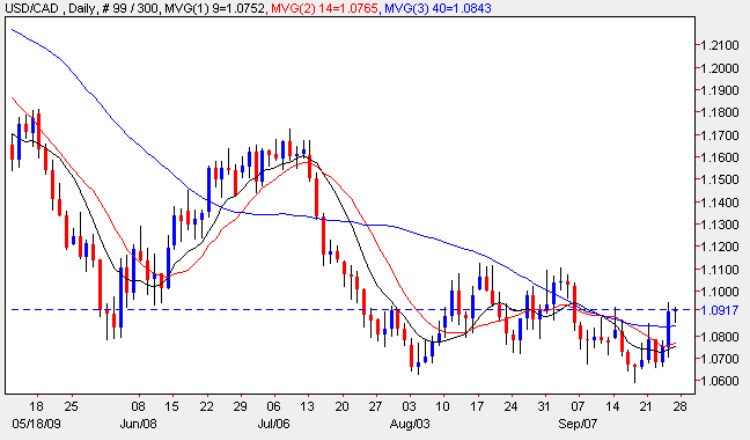 The usd to cad currency pair were another of the majors to benefit from some strong buying of the US dollar yesterday following the markets reaction to the FOMC meeting on Wednesday, and as a result the pair closed the trading session with a wide spread up bar which broke above all three moving averages and deep into the initial resistance level immediately above. Whether this renewed interest in the US dollar is a temporary reprieve or a longer term change in sentiment only time will tell, but the former seems more likely since little has changed on the fundamental economic picture since Wednesday, and the US dollar index still looks extremely fragile from a technical perspective with the latest daily chart on the curency options trading site telling it’s own story! For the usd to cad pair, the first key level for any longer term rally higher will be whether the pair have sufficient momentum to break and hold above the 1.100 price handle, and should this occur then we could see this provide the platform for a further push higher. All this seems unlikely at present, and what is more likely is that we will see a continuation of the bearish trend in due course, with yesterday’s bullish move seen simply as a short term reaction for the US dollar. However with a relatively well established floor at the 1.065 region, we will now need to see this breached in order for the bearish move to continue lower for the usd to cad in the short term. With no fundamental news for Canada today on the economic calendar, the focus of attention will once again be in the US, and I have covered all the major items for today on the euro vs dollar site.